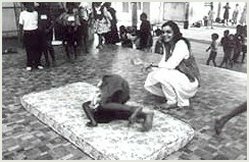 In a tie-up with THE HINDU newspaper as part of The Hindu's and Arangham's Outreach activities, Anita Ratnam and members of Arangham Dance Theatre were invited to visit New Delhi's Yuva Shakti Modern School in February 2002 and conduct a workshop that jogged young minds out of the humdrum of competitive academics. The one-day workshop went beyond expectation with excited students begging for more and promising they would NEVER regard themselves as flat footed nerds who had no ear for music or dance! " No one spoke to us so freely and honestly and enquired about what we want to do," admitted Abhijit Mohanty, Delhi Public School, New Delhi. "We are happy to inform you that the participants, teachers and heads of institutions expressed their gratitude to The Hindu in conducting this workshop and the skills learnt by the participants which was professionally highlighted by your kind self and your team. " 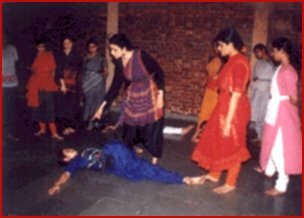 Geeta Chandran, well-known Bharatanatyam dancer and President of "Natya Vriksha", a dance academy at New Delhi, organized a movement encounter "Anga", with Anita Ratnam and the Arangham Dance Troupe at New Delhi, in October 1999. Held at The Academy of Fine Arts And Literature, the studio of the famous contemporary painter, Arpana Caur, it was an intense three hour session with Odissi, Bharatanatyam and Kathak dancers. 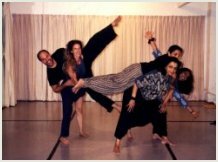 The workshop explored the formalism of classical dance training with its set rhythms, music, symmetry and harmony. A conscious attempt was made to push these boundaries to its utmost limit. The focus was also to study the origin of movement, to concentrate on its quality and to realize its essence in a performance. The ensemble work, kept individuality in tact and explored balance, levels and movement in clusters. Commenting at the conclusion of the exploration, Geeta Chandran, host to the workshop declared, "Through her Anga workshop Anita Ratnam made my dancers realize that the space between bodies need not be inert and dead; the crevices in between us are all alive, and can be carved afresh to create new choreographic dimensions."